Bounce up and down the circular track of the Tumble Bug, one of only two surviving tumble bugs in the United States. In earlier years Tumble Bug rides could be found at many amusement parks across America, but they have now become a rarity. Only two full-sized Tumble Bugs are now operating in the United States – this one at Conneaut Lake Park, and one at Kennywood. Conneaut's is the earlier of the two, having been installed in 1925. Full size Tumble Bugs, all manufactured by Travers Engineering Company of Beaver Falls, Pennsylvania, have an undulating circular track. The ride cars are attached to a central column and are propelled around the track through drive motors mounted between them. 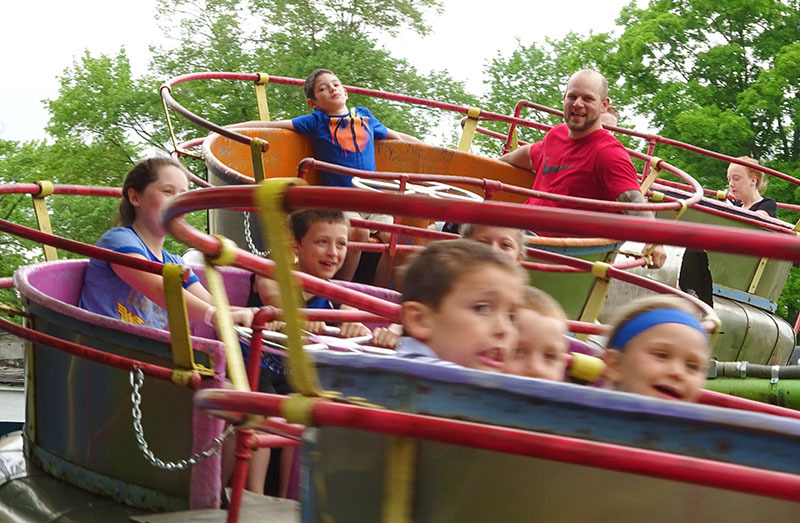 Conneaut's Tumble Bug still gives a great ride experience, even though it is almost 100 years old. Ride cycles are long, with cars taking many laps around the track. They pick up quite a bit of speed, with centrifugal forces and the hills in the track pushing riders in all directions. Spare parts for the rides are no longer available, which has been a major contributor to the loss of many other examples. However, Conneaut keep theirs up and running by getting new parts made as required from time to time.